The Storybook style is a combination of whimsy, charm, fairy tales, rural simplicity, and cottages, popular in the 1920s particularly in Southern California. 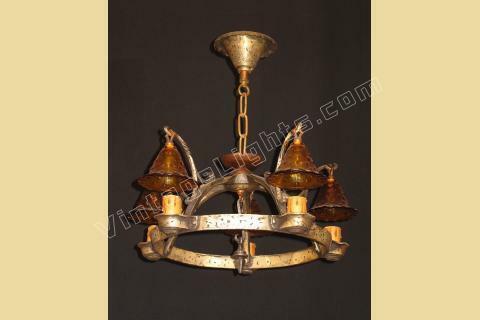 You can imagine this antique fixture hanging in Marie-Antoinette's mill in the Hamlet she had built in Versailles (google it if you have not seen it). Original hob-nail glass shades commonly called "smoke bells" (from when oil lamps and candles had bells over the flame to disperse the smoke so a dark spot would not appear on the ceiling) have an amber / yellow tint to them. Another design feature of the Storybook style is that it appeals to a wide variety of architectural styles from Craftsman to Tudor to all the Revivals siblings (Spanish, Italian, Gothic etc, etc). Original finish and patina which has been lightly waxed to help preserve its vintage authenticity. Possibly 2 Ceiling fixtures available. We sometime get in matching single bulb pendants and wall sconces.